The Ricardo's neighbor, Miss Lewis, has fallen for Mr. Ritter, the local grocery man, claiming he's the "bee's knees," but the spinster's too shy to invite him to dinner herself. Lucy offers to do it for her, shades of Cyrano de Bergerac, but Ritter gets the wrong idea and thinks Lucy is the one who's crazy about him. Mr. Ritter: "I like you, too. You're just my type, Red." Finally, Miss Lewis appears - flashing her "come hither" look, which Lucy taught her earlier, and captures the beloved grocer. Special Notes: Bea Benaderet appeared on Lucy's radio show, My Favorite Husband, and was Lucy's first choice to play what eventually became the Ethel Mertz character. 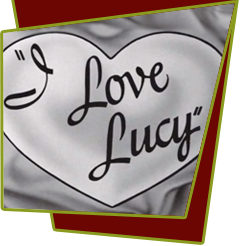 This episode is based on lucy's radio show, My Favorite Husband, Episode #31, "Valentine's Day". Bloopers: When Miss Lewis and Lucy are talking, a cymbal is heard. A band member accidentally hit the cymbal. The nightclub filming set was next to the apartment set.